"Massive thanks to Silver Fern Marquees for the beautiful marquee and other bits and pieces! They were fantastic to deal with and so helpful in choosing the right layout and combination of items we required"
"Thank you so much for all your advice and help towards planning our wedding. The marquee was amazing and all the extras that went along with it were perfect. We are so happy with how everything came together and turned out!" "Blair, you and the guys were awesome from beginning to end. You saved my bacon when the first marquee didn’t fit in the space that I had measured poorly! To dash back to your yard and bring a different size of marquee was outstanding service. My son and daughter-in-law had a fabulous wedding and we couldn’t have pulled it off without your help!" "Loved the kids table and chairs I hired for my daughter's first birthday"
"Thanks to Blair and the team from Silver Fern Marquees for your help with my 21st. The quality of the marquee and the lighting exceeded our expectations and the set-up was awesome. Highly recommend Silver Fern!" 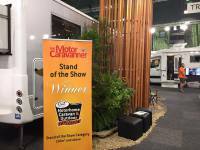 "The fact we have won 'Site of the Year' at the Auckland Motorhome Show three times in a row speaks for itself... and our sales continue to grow each year. These guys go the extra mile to create an attractive exhibition site that people want to be at"